Do you have a minute to spare to learn some English? 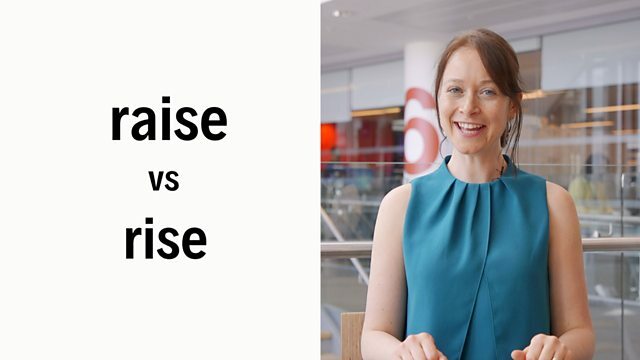 Listen to Sian summarise the difference between raise and rise! Give us 60 seconds and we'll give you the English! Hi, I'm Sian for BBC Learning English. And today, we're going to look at the difference between raise and rise. So raise and rise both refer to something going up, but there's a difference in how we use them. Raise always needs a direct object – so if you raise something, you move it up. For example: I raise my eyebrows when I'm surprised! And it doesn't have to be literal – so: The government plan to raise taxes. Don't forget this is a regular verb, so the past and past participle are both raised. But with rise, there's no direct object. So if something rises, it goes up or increases by itself. The sun rises at 6 a.m. at the moment. Careful, this is an irregular verb so the past is rose and the past participle is risen. Both raise and rise refer to something going up, but there is a difference. Raise needs a direct object - if you raise something you move it up. It has both literal and non-literal meanings and it is a regular verb, so it's past and past participle forms are raised. I raise my eyebrows when I'm surprised. The government plan to raise taxes. He raised his voice at me in anger, but I forgave him. Rise does not take a direct object - things rise or go up by themselves. Rise is an irregular verb so the past form is rose and the past participle is risen. The sun rises at 6a.m. The water level rises twice a day because of the tide. The bird rose into the air and flew away. Raise and rise have something in common, what is it? Does raise or rise need a direct object? Is rise a regular or irregular verb? Which form of rise is incorrect?